Animation is the medium that allows for a dramatization of a skirmish with nature. In Segundo de Chomón’s Création de la Serpentine (1908), a sorcerer transforms a billowing piece of fabric into a woman who performs a brief serpentine dance before being joined by other dancers, all manipulating large veils of silk. Together, the dancers create a dizzying, airy spectacle of animated fabric that conjures images of flowers and clouds before morphing, through a dissolve, into flames (fig. 1). Fig. 1. Serpentine dancers transforming into fire in Création de la Serpentine. From: https://archive.org/details/CrationDeLaSerpentine. Fig. 3. The magical growth of a rose in Little Nemo. From: https://archive.org/details/LittleNemo. I see these connections as opportunities to think in new ways about historicizing and theorizing early animation. In animation studies, metamorphosis tends to be linked to the wondrous (im)possibilities of animated forms that are, by nature, not bound to the natural world but rather exploit longstanding affinities with fantasy, dream, and magic. Without questioning the importance of these affinities, I wonder what natural history can teach us about the origins of animation in what Tom Gunning calls “a fantasy of metamorphosis or the potential for transformation.”[iv] Chomón seems to point to this in the way that the serpentine dance in Création embodies those qualities of the protean and the plasmatic that are so important to understanding the nature of animation and, I suggest, animation’s relationship with nature. Colin Williamson is an assistant professor of Film and Screen Studies at Pace University (NYC). He is the author of Hidden in Plain Sight: An Archaeology of Magic and the Cinema (2015), and has published in such edited collections and journals as Thinking in the Dark: Cinema, Theory, Practice (2016), Leonardo, The Moving Image, and animation: an interdisciplinary journal (ANM). Colin is currently a reviews editor at ANM and serves on the Executive Committee of Domitor, the International Society for the Study of Early Cinema. His research has been supported by fellowships from the University of Pennsylvania, the American Academy of Arts and Sciences, Harvard University, and Rutgers University. Colin received his Ph.D. in Cinema and Media Studies from the University of Chicago. [i] I have written about this dimension of time lapse in my book, Hidden in Plain Sight: An Archaeology of Magic and the Cinema (New Brunswick: Rutgers University Press, 2015). [ii] Esther Leslie, “Animation and History,” in Karen Beckman (ed. ), Animating Film Theory (Durham: Duke University Press, 2014), p. 29. [iii] See, Sergei Eisenstein, Eisenstein on Disney, ed. Jay Leyda and trans. Alan Upchurch (Calcutta: Seagull Books, 1986). 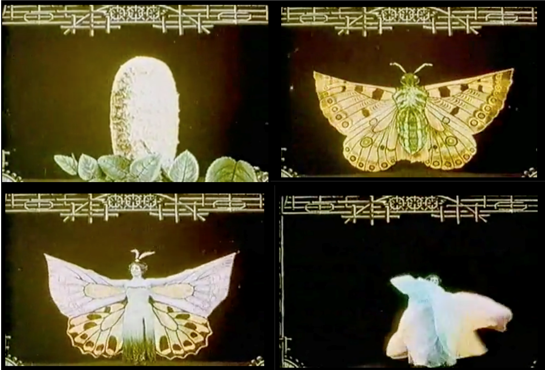 [iv] Tom Gunning, “The Transforming Image: The Roots of Animation in Metamorphosis and Motion,” in Suzanne Buchan (ed. ), Pervasive Animation (New York: Routledge, 2013), p. 56. Fascinating blog! I wonder if a way of reconciling the schism between natural history and fantasy/magic that you mention here is to think about both in terms of modes of social representation? Marina Warner (2002) writes on metamorphosis as an inherently social gesture, articulating through phantasmagoria a desire for change. Is the difference between the ‘natural’ and the ‘fantastic’ in de Chomon’s work merely a difference between representing the way things are and the way things could be?